In the choose-your-own-adventure world of human-powered sports, Lake Tahoe is an unmatched aquatic playground. There’s nowhere else you can paddle the glassy waters of the continent’s largest alpine lake in the morning, and rollick down the rapids of the Truckee River in the afternoon. For those who have lounged at the water’s edge of a Lake Tahoe beach and watched enviously as paddleboarders and kayakers paddle by, here’s your guide to four on-the-water adventures that will get you out of your comfort zone and onto the crystalline water’s of one of the world’s most magnificent lakes. 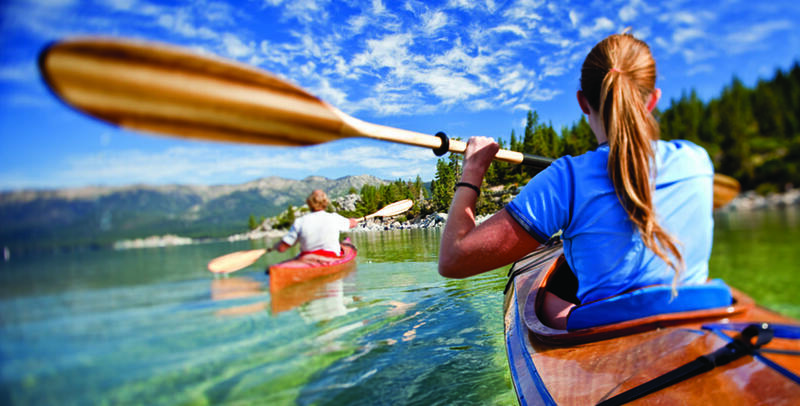 Paddling from lodge to lodge or campsite to campsite in a multi-day trip is the type of Tahoe getaway that will create memories that last a lifetime. Some might not be inclined to paddle twenty miles a day and set up camp; don’t worry, we’ve got you covered. Figuring out your itinerary might seem like daunting task for intermediate paddlers new to the lake, but the Lake Tahoe Water Trail makes it very simple. There’s an easy-to-use map that shows you campgrounds, lodges, and hotels right on the water so you can find the perfect place to stay during your adventure. Whether you want to set up a tent at a lakeshore campground or sit on a patio and have a drink, there are a ton of places to stay. Always wanted to hit that hidden beach that is hard to get to from the road? Search this list of north shore beaches to paddle to, and go for a refreshing swim, including several hidden beaches that are local favorites. Check the weather conditions before you start your journey each day. Always bring a life jacket, and make sure you pack a lunch, water, and anything else you need to stay overnight. Boats and gear can be rented or purchased from multiple locations such as Tahoe City Kayak, Tahoe Paddle & Oar, Tahoe EcoSports, Adrift Tahoe, Tahoe Adventure Company, Waterman’s Landing, Willard’s Sport Shop, West Shore Sports and Tahoe Mountain Sports, Truckee River Rafting, and the Truckee River Raft Company, just to name a few. Whether you’re looking to experience some whitewater, or you’d rather just float along a peaceful stretch of the Truckee River, rafting or kayaking down the river is an unforgettable experience for people of all ages. You can pick your starting location, and some rental stores will even drop you off and drive you back to your car so you don’t have to worry about walking back and finding your car in the dark. If you want to stop for a quick lunch or a sunset dinner, there are plenty of places along the river to paddle up to for a bite to eat. Stand-up paddleboarding, otherwise known as SUP, is a relatively easy and accessible human-powered sport to explore for anyone looking to jump all-in on some lake adventures during their stay in Tahoe. Onlookers may assume the SUP life is a tranquil one, but you’re actually getting a great core workout that’s going to challenge those muscles you’re not using as much while hiking. Of course, it also provides the opportunity for stellar views of the lake and shoreline. Beginners looking to get down the basics can sign up for classes at West Shore Café, where paddleboards are available on a first-come-first-serve basis. Equipment can also be rented at one of the many water sports rental locations listed at the end of this blog. When paddleboarding, make sure to wear the leash attached to your board, so the board doesn’t make an escape into the lake if you plunge into the cool mountain water. And if you are sensitive to cold water, wear a wetsuit on your SUP adventures. Boards and gear can be rented or purchased from multiple locations such as Tahoe City Kayak, Tahoe Paddle & Oar, Tahoe EcoSports, Adrift Tahoe, Tahoe Adventure Company, Waterman’s Landing, Willard’s Sport Shop, West Shore Sports and Tahoe Mountain Sports, Truckee River Rafting, and the Truckee River Raft Company, just to name a few. For those looking for an even more immersive experience, you can put your flexibility and balance to the test with a SUP yoga class. Mountain Lotus Yoga hosts daily classes in the mornings and evenings lasting between one and one and a half hours. Then West Shore Café hosts morning classes on Saturdays through September 3 from 8 – 9 a.m. You can learn from poses from instructors with years of teaching experience that will undoubtedly challenge your body. The post From Flatwater to Whitewater — Four Must-Experience Aquatic Adventures in North Tahoe appeared first on Go Tahoe North.